Thanks, I'm pretty happy with the red highlights. 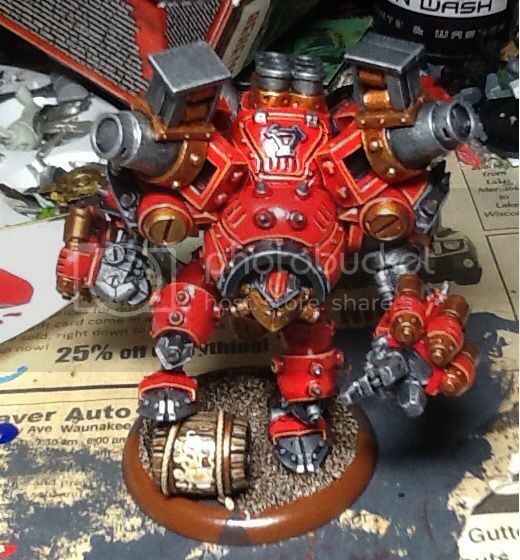 I'm running out of Khador stuff to paint though. I've spent about $100 total on the hobby, and half of that was just on books and tokens. 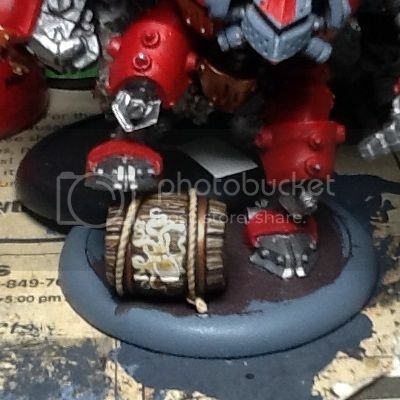 I'm fortunate enough to be painting someone's Cygnar and getting paid in models. And I'm also selling everything I can for 40K and buying Warmachine. I've got some man o war finished and based. And I'm at the basing stage with some widowmakers. Play like you've got a pair...of dice. Because, well, you're going to need those for stuff. Here's some gun mages I'm painting up for a friend. I'm about half done with them, and they're on temporary bases. 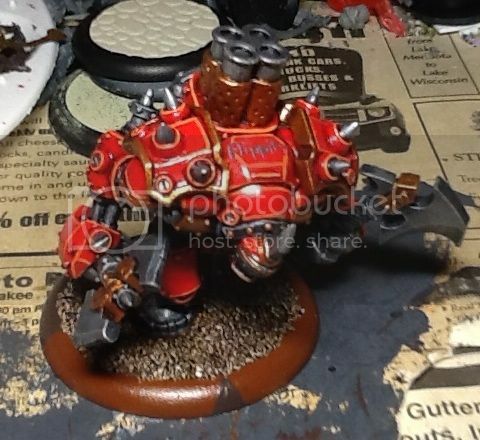 I have played only one game of Warmachine so far, but I feel I have already painted my fair share. By the time I actually play in a tournament, I should have painted at least two 35pt forces. Behemoth day 1: Didn't even finish with the base colors before the leg joint gave out. It didn't break, just began to sag. I don't like fixing models partially painted. Luckily I came up with a creative solution. 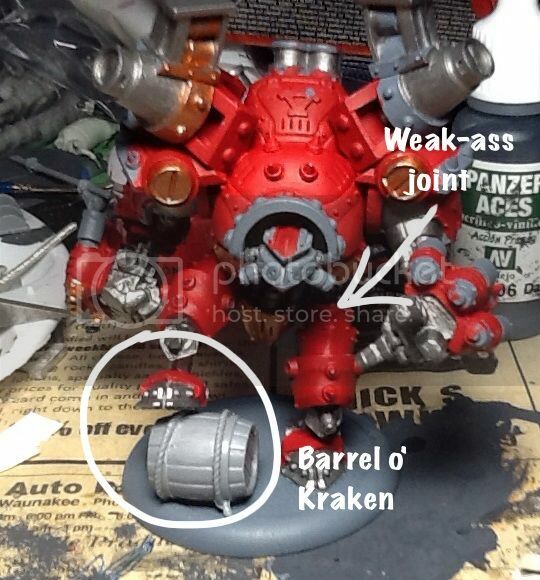 The warjack will now have a leg up on a barrel of Kraken rum. In hindsight, it's much better than just the basic pose. It helps to alleviate my disappointment in using the standard pose. I got lazy, and fate has punished me for it. Yeah, Behemoth has a lot of weight for that one joint to support. Putting his leg up on something is a good solution. I can fight three but it's not terribly comfortable for the person in the back if they're not short. Lol, I expected a hobby video. I see what you did there. Got a few warjacks finished. 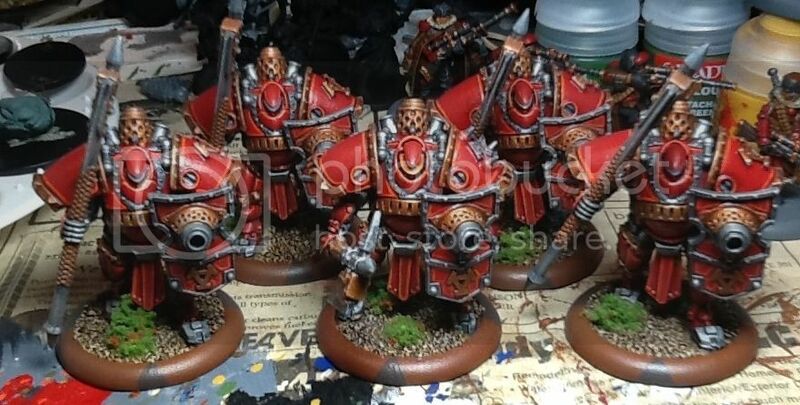 Actually, I've painted all of the Khador warjacks I own now. Looking good! 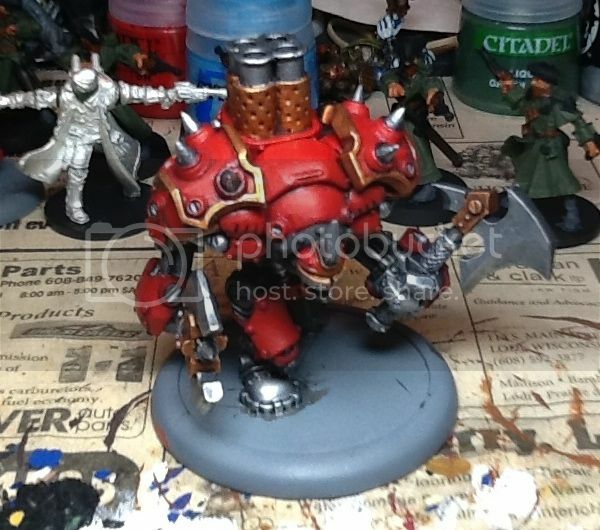 I really like the stark highlights on the Cygnar jack. Listen, newbie, we're the villians. We play rough. You didn't die, so quit your whining and go do something useful.